There were 2.6 million casual employees in Australia in August 2018. The casual share of total employees fell slightly from 25.1 per cent in August 2017 to 24.6 per cent in August 2018. In August 2018 there were 126,000 employees who were paid by a labour hire company or employment agency—accounting for only 1.0 per cent of all employed persons. This employment share has changed little over the past decade. There were just over one million people working as independent contractors in Australia in August 2018. The number of independent contractors has been very stable over the past decade. However, their share of total employment has fallen slightly from 9.0 per cent to 8.0 per cent. Public sector employees were much more likely than private sector employees to be on a fixed-term contract in August 2018 (12.5 per cent compared with 3.8 per cent). In line with structural shifts in the economy, the Australian labour market has undergone significant change over the past 30 years. This has included the emergence of service industries as the driving force of the economy and employment growth. As a result of this transition, there has been very strong growth in labour force participation of women, strong growth in part-time and casual employment (for both women and men), and a decline in the permanent full-time employee share of total employment. In the past few decades other non-standard or non-traditional forms of employment such as labour hire, employees on short-term contracts, and engagement of independent contractors have emerged as hiring options for employers. This snapshot sheds light on the significance and contribution of different forms of employment to the Australian economy. The annual ABS publication Characteristics of Employment (cat. no. 6333.0) provides information on growth in different forms of employment as well as the characteristics of different employee types. These characteristics include gender, age, occupation, industry, skill level, duration with current employer and expectation of being with the same employer in 12 months. The ABS publication also provides information on trade union membership and is a source of data for median earnings of different types of employees. The responsibility of employers for providing entitlements to workers can vary depending on whether the employer directly engages the worker as a permanent or casual employee on a fixed-term contract, or as an ongoing employee. Employers also have options to recruit workers from a labour hire firm or employment agency (which accepts the responsibility for on-hired workers) or engage the services of independent contractors (who don’t have employee entitlements). Casual employees are workers without access to paid leave entitlements (such as sickness and holiday pay and other forms of personal leave) and are usually paid an additional hourly payment or loading (usually between 15 and 25 per cent) as compensation. Casual employees may be engaged on a fixed-term contract or may continue to work with the same employer for a period of time depending upon the availability of work. Permanent employees are workers with access to leave entitlements who can be engaged on an ongoing basis or on a fixed-term contract. Labour hire employees are people who found their current job through a labour hire firm or employment agency and are paid by the firm or agency. Labour hire firms and agencies undertake the screening, selection and placement of people for employing organisations and also engage in the supply of their own employees to employers for a specified period. Independent contractors are persons who operate their own business and are contracted to perform services for others without having the legal status of an employee. In other words they are persons who are engaged by a client, rather than an employer to undertake the work. An employee on a fixed-term contract is engaged for a specified period that ceases on a particular date or event. In August 2018 there were around 2.6 million casual employees in Australia who accounted for 24.6 per cent of all employees. In the 12 months to August 2018, the number of casual employees grew by 43,400 or 1.7 per cent while the number of permanent employees grew by 346,100 or 4.6 per cent. This contributed to a slight fall in the casual share of total employees from 25.1 per cent in August 2017 to 24.6 per cent in August 2018. Total employees includes permanent and casual employees but excludes owner managers of incorporated and unincorporated enterprises. The casual employee share of total employment also fell in this period from 20.7 per cent to 20.5 per cent. Total employment includes permanent and casual employees as well as owner managers of incorporated and unincorporated enterprises. Prior to the most recent 12 month period, there are two distinct periods that can be observed where the number of casual employees was either growing more strongly or more weakly than permanent employees. Between 2004 and 2012 the number of casual employees grew at an annual average of 1.7 per cent and permanent employees grew at an annual average of 3.1 per cent. This trend was reversed between 2012 and 2017 when the number of casual employees grew at an annual average rate of 2.9 per cent compared with an annual rate of growth of 1.2 per cent for permanent employees. Over the longer period from August 2004 to August 2018, the number of casual employees grew by 34.7 per cent and the number of permanent employees grew by 41.4 per cent. 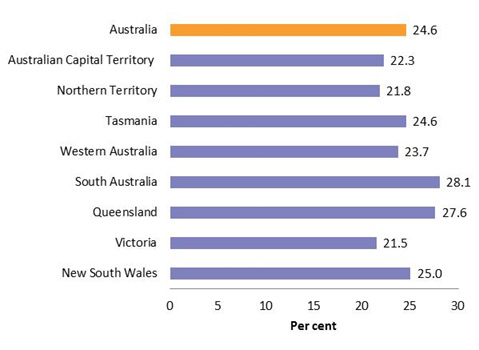 South Australia and Queensland had the highest prevalence of casual employees in August 2018at 28.1 per cent and 27.6 per cent of all employees respectively, while Victoria had the lowest prevalence at 21.5 per cent. In August 2018 there were 126,000 employees who were paid by a labour hire company or employment agency—accounting for only 1.0 per cent of all employed persons. This employment share has barely changed over the past decade. The low count for this group of employees is perhaps surprising, but could partly be explained by confusion among survey respondents as to whether they are being paid by a labour hire firm or the organisation they are on-hired to. Further investigation of the latest data revealed 427,000 people found their current job through an employment agency and 166,000 through a labour hire firm. Labour hire employees are much more likely to be employed on a casual basis and have a greater expectation of leaving their employment in 12 months. Almost four in five (78.8 per cent) of labour hire employees in August 2018 were employed on a casual basis compared with the average for all employees of 24.6 per cent. Just under a quarter (24.4 per cent) of labour hire employees did not expect to be working for the same employer in 12 months—more than double the estimate for all employees (at 9.9 per cent). The proportion of employees with a fixed completion date or event in Australia has remained steady over the past four years at just over 5 per cent. Permanent employees were just as likely as casual employees to be on a fixed-term contract in August 2018 (both 5.2 per cent). However, employees in the public sector are more than three times as likely to be on fixed-term contracts as private sector employees (12.5 per cent in August 2018 compared with 3.8 per cent). Public sector employees on fixed term contracts accounted for 37.6 per cent of all employees on fixed-term contracts in August 2018. To put this into perspective, all public sector employees accounted for 15.6 per cent of all employees in Australia at this time. According to the Fair Work Ombudsman ‘independent contractors run their own business, usually negotiate their own fees and working arrangements and can work for more than one client at a time. Independent contractors are often called contractors or subcontractors (or ‘subbies’)’. The difference between an employee and independent contractor is based on a number of factors. These differences include the degree of control over work they undertake, hours of work they perform to complete tasks, and who bears financial risks associated with their work. Sub-contractors also have responsibility for making superannuation contributions and paying taxes (including GST) to the Australian Taxation Office. More information on the differences between employees and independent contractors can be found on the Fair Work Ombudsman website. According to ABS data there were just over 1 million people working as independent contractors in Australia in August 2018—little changed from August 2017. The number of independent contractors has remained very stable over the past ten years while their share of total employment has fallen slightly from 9.8 per cent in November 2010 to 8.0 per cent in August 2018. The latest ABS data indicated a slight fall in the casual share of total employment and employees in the year to August 2018 compared with the previous year, as well as a small fall in the independent contractor share of total employment. Claims have been made by some economic commentators and unions about the growing casualisation of the workforce and disproportionate growth in non-traditional or non-standard forms of employment. These claims are not supported by the latest data. While there have been periods where growth in casual employment has been stronger or weaker than permanent employment over the past 14 years, the casual share of employees and employment has not changed substantially in this time. In fact, over the whole period analysed, growth in the number of permanent employees has been stronger than growth in casual employees. The latest ABS data also shows the independent contractor share of total employment has been falling slightly since 2010, and labour hire employees have continued to account for a very small share of total employment in Australia over the past decade. For copyright reasons some linked items are only available to members of Parliament. With the exception of the Commonwealth Coat of Arms, and to the extent that copyright subsists in a third party, this publication, its logo and front page design are licensed under a Creative Commons Attribution-NonCommercial-NoDerivs 3.0 Australia licence. In essence, you are free to copy and communicate this work in its current form for all non-commercial purposes, as long as you attribute the work to the author and abide by the other licence terms. The work cannot be adapted or modified in any way. Content from this publication should be attributed in the following way: Author(s), Title of publication, Series Name and No, Publisher, Date. To the extent that copyright subsists in third party quotes it remains with the original owner and permission may be required to reuse the material. Inquiries regarding the licence and any use of the publication are welcome to webmanager@aph.gov.au. This work has been prepared to support the work of the Australian Parliament using information available at the time of production. The views expressed do not reflect an official position of the Parliamentary Library, nor do they constitute professional legal opinion. Any concerns or complaints should be directed to the Parliamentary Librarian. Parliamentary Library staff are available to discuss the contents of publications with Senators and Members and their staff. To access this service, clients may contact the author or the Library‘s Central Enquiry Point for referral.